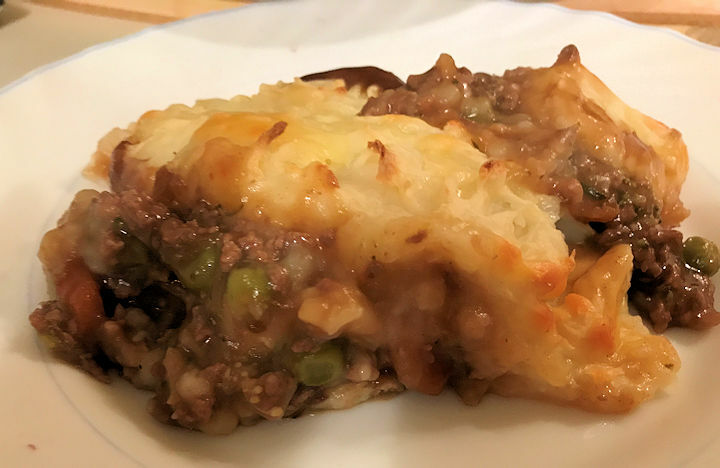 I haven’t made Shepherd’s Pie in quite a while and I have never tried the Symply Too Good version, so last night seemed like as good a night as any to tackle this dish as part of my personal recipe challenge. There are a LOT of veggies in this dish from Symply Too Good To Be True Book 2. I would normally make shepherd’s pie with just the peas, carrots and onion but I’m trying to have us all eat more vegetables so I pushed the boundaries as far as I thought I could. I’ll be the first to admit, I absolutely HATE vegetables (unlike my son who is happy to just eat a bowl of veggies for dinner). I’ll eat most of them if they are in a dish but there are very few I can stomach on their own. 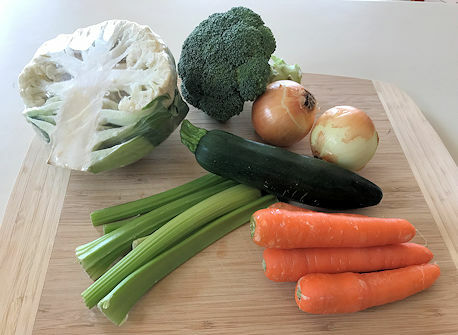 I decide to commit to carrots, peas, onion, cauliflower, broccoli, celery and zucchini. The actual recipe also calls for corn and green beans – these are both hard passes for our house so I just add extra of the other veg. Slice and dice the vegetables and then you will want to cook them before you get started. I decided to grate the zucchini instead of dicing it as suggested so I left the zucchini to the side for the moment. Coat a large saucepan with cooking spray and use it to cook the mince. Once cooked, drain if necessary before returning to the same pot. Time to add tomato sauce, Worcestershire sauce, oyster sauce, stock powder, Gravox and water. Obviously this is a lot easier if you thoroughly mix the gravy powder into the water before adding it to the meat or else you’ll end up with lumps. Combine well and bring to boil. Add the pre-cooked vegetables and stir through. Pop the lid on the saucepan and simmer for around 5 minutes. If you are not using a good quality non-stick cookware, you will want to give this a stir occasionally to avoid it caking it to the bottom of the pan. When done, take it off the stove but leave the mixture in the saucepan for the moment. Peel, dice and boil potatoes. Once they are done, drain and mash with the skim milk. 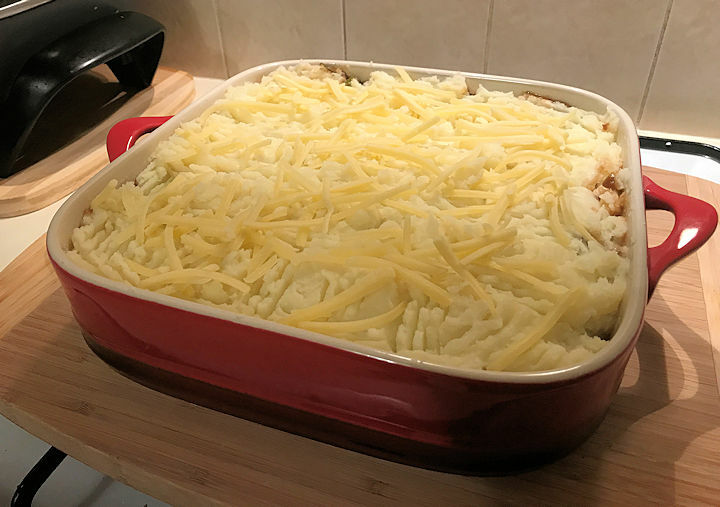 Pour your mince into a large dish (the book suggests you reheat it first assuming you’ll finalise it under the grill … I planned to put mine into the oven so I skipped this step). Top with the mashed potato and then sprinkle with grated cheese. (When I usually make this, I make the mince the day before and it ‘sets’ in the fridge overnight, keeping the potato from sinking into the meat during cooking). Here is mine ready to be finished off in the oven. Definitely a winner for a family meal. A great way to smuggle extra veggies into the diet and this one scored a 9/10 from the critics at home. I can see this being added to the regular rotation of meals in the household going forward; it tastes great, it was easy to make, and it’s budget-friendly. Cost-wise, it roughly came out around $11 (that is with premium 5-star mince) for a good sized dish … more than enough to feed a family of 4 with leftovers for lunch the next day.